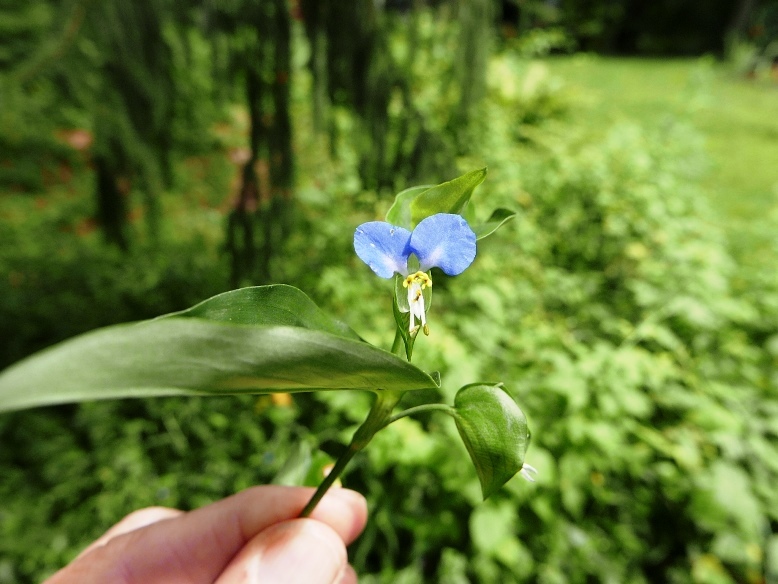 In the ChatScape there is a lovely little flower, the Asiatic dayflower, Commelina communis, which has taken advantage of our travels this summer, invading any number of garden sites. It is well-known to move into “disturbed” sites, which may say something of this laissez-faire gardener, if not my wife. This herbaceous wanderer has quite a storied profile, from its two sky-blue petals subtended by one small white petal to the use of its blue pigments in Japanese dyes for woodcuts. Dayflower is studied for possible bioremediation for removing toxic levels of copper in soils. Its stomate (gas exchange sites in leaves) physiology intrigues researchers. It has an elaborate pollination ecology, and it is used in Asian medicines. As for the complexity of it unusual flower anatomy, well, fuggeddaboudit! As for its common name, as you may suspect, like daylily (Hemerocallis) the blossoms of Asiatic dayflower are predictably short-lived, each for a day. The Latin name, though, is more interesting. Linnaeus, the Swedish botanist who gave us the idea of the Latin binomial for all living things, notably for plants with his Species Plantarum in 1753, named this plant Commelina communis. Linnaeus did so in “honor”of two Dutch botanists Jan and Caspar Commelijn. An honor in name only, since the “communis” part of the Latin name expressed the opinion of Linnaeus that his former fellow plant-lovers were a bit pedestrian in their talents. Dayflower, not so common, but not so restrained in your garden. Perhaps I shall encourage the leaf spot disease alive and well on its leaves in my “garden”, though, surely it shall merely irritate rather than deter dayflower from its appointed rounds. Dayflower hoe! Dayflower leaf spot. Linnaeus and Commelinius Hoe!